You can plan projects, schedule tasks, assign resources, and track changes by using Microsoft Project to manage data in Visual Studio Team Foundation Server. By using Microsoft Project, you have access to features that Team Foundation Server does not have, such as a project calendar, Gantt charts, and resource views. To use Project or Project Professional to track and manage team projects in Team Foundation, you must install Visual Studio or Team Explorer on your client computer to get access to the Team Foundation plug-in. You can download Team Explorer from the following page on the Microsoft website: Microsoft Visual Studio Team Explorer 2010 - ISO. To use Project Professional to synchronize work items in Team Foundation, you must install the Microsoft Visual Studio Team Foundation Server 2010 and Project Server Integration Feature Pack on Project Server and install Service Pack 1 (SP1) for Visual Studio 2010 on your client computer. For more information, see Microsoft Team Foundation Server 2010 and Microsoft Project Server Integration Feature Pack. 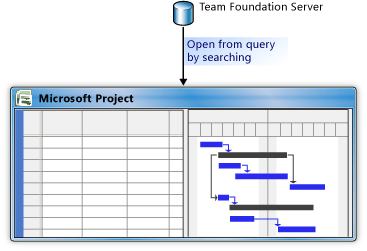 You can use Microsoft Project to manage and track Team Foundation work items. When you install Team Explorer, you also install the add-ins to Microsoft Project that integrate Microsoft Project with Team Foundation Server. Create a work item query, and view results. If you are using Team Explorer, select all or a subset of work items that you want, click Open in Microsoft Office, and then click Open in Microsoft Excel. If you are using Team Web Access, open Microsoft Project, and import the work item query into Microsoft Project. Add or modify work items in Microsoft Project, and publish changes to Team Foundation Server. Connect to Team Foundation Server. Add, import, and modify work items in Microsoft Project . Publish changes to Team Foundation Server. All work items that are linked to tasks selected for import into Microsoft Project, and whose link type corresponds to predecessor-successor or parent-child, appear in the project plan. If you create a project plan from Team Foundation work items, you must save the project plan. Microsoft Project stores information that Team Foundation Server does not, therefore, even if you publish work items back to the work item database it does not guarantee that your Microsoft Project information will be saved. For more information about how Microsoft Project and Team Foundation Server handle project scheduling together, see Quick Tips and Operational Differences when Tracking Tasks Using Microsoft Project and Team Foundation. Learn about operational differences and essential tips to avoid problems. You use Microsoft Project and Team Foundation Server differently because they have different strengths for work item management. You can avoid problems by understanding how to best use each tool to build a schedule, assign resources, and maintain the data. You also use Microsoft Project itself differently, because the integration with Team Foundation gives you access to new tables of data and new views. Schedule a project. You can use work items to create a project plan, or you can use project tasks to create work items. Modify work items by using Microsoft Project. You can create work items, copy and paste work items, and modify work items by using Microsoft Project. Create relationships between work items. When you link tasks in Microsoft Project, Team Foundation Server creates predecessor-successor relationships between the work items in the database. Synchronize data between Office Project and Team Foundation Server. You can selectively disable publishing of work items to the work item database and re-enable publishing later. Correct summary tasks that are reporting hours. If you determine that hours are counted twice in reports that contain task hours, you can correct the problem by using the Work Items With Summary Values team query. Support round-tripping of new fields for manually scheduled tasks in Project 2010. To round-trip new Project 2010 fields, you must customize the task work item type and the Microsoft Project Field Mapping file for the team project. This strategy is of particular interest if you want to allow team members to manually schedule the duration and start and finish dates for their tasks. Connect your project plan to a team project. To add or modify Team Foundation work items in Microsoft Project, you must connect your project plan to the appropriate server that is running Team Foundation Server and select the collection that hosts the team project. Also, if your team project is moved to a different team project collection, you must reconnect the document by reconfiguring the server connection. Update your plan while working offline. After you create a project plan, you can continue to work even when you must disconnect your computer from the network. After you reconnect to the network and to Team Foundation Server, you can publish work item changes and refresh the project plan. Select which data fields of a work item are published. You can customize how data is published and refreshed when you modify the project mapping file. Perform a bulk addition of work items or update existing work items. You can use Microsoft Excel to add new work items, modify them, link them to each other and to other items, and publish them to the work item database. You can add or update many work items at the same time, and the capabilities of the Microsoft Excel client make it easy to perform these tasks. Understand the choices for managing team projects. You can learn about the benefits and operational differences of using the Team Foundation plug-in to Microsoft Project compared to integrating Team Foundation Server with Project Server.